Real Madrid have the chance to close the gap with Atletico Madrid to two points with a win against stubborn Valencia. It has been a disappointing season for Madrid but the return of Zinedine Zidane has been the silver lining for the Los Blancos. They have won the two games played under him and the Frenchman would be looking to complete a hat-trick of wins away at Villareal. The hosts are a difficult team to beat despite bring sixth and could pose a challenge for Real Madrid. With games coming thick and fast, Zidane would be looking for a second place finish for Madrid before they go for a massive overhaul in the summer. Valencia vs Real Madrid - Live Football Score. Cristiano Piccini, Francis Coquelin, and Ruben Soriano are out for Valencia with fitness issues which means Daniel Wass and Jose Gaya are likely to start. Ezequiel Garay and Gabriel form a stable partnership at the heart of the defence for the hosts. Rodrigo and Kevin Gameiro could trouble the Madrid defence with their movement and finishing. Goncalo Guedes is the chief playmaker of the side and his job is to bring Gameiro and Rodrigo into the game with his accurate passing. Raphael Varane will start for Los Blancos with Nacho suspended and the Frenchman whose future at Madrid has been the talk of the two could focus on things on the pitch rather than off it. Gareth Bale and Isco who have once again gained prominence since the arrival of Zidane will bomb forward and help Karim Benzema who will be the lone striker. In midfield, the trio of Casemiro, Toni Kroos, and Luka Modric could outclass Valencia with their qualities. 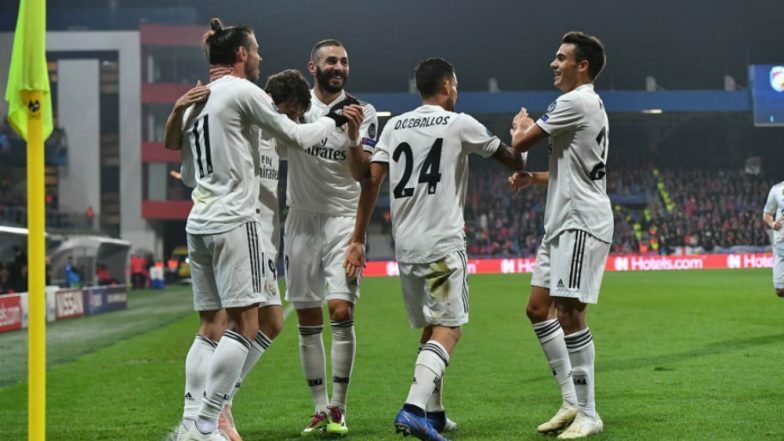 When is Valencia vs Real Madrid, La Liga 2018-19 Football Match Schedule (Date, Time and Venue Details)? Valencia and Real Madrid lock horns against each other in the La Liga match on April 04, 2019 (late Wednesday night). The Valencia vs Real Madridwill football match be held at the Mestalla. It will kick off at 1:00 am IST. How to Watch Live Telecast of Valencia vs Real Madrid, La Liga 2018-19 Football Match? Sony Pictures Networks holds the broadcast rights of La Liga in India. So, the Valencia vs Real Madrid match will be live telecast on Sony Six and Sony Six HD channels. If you are unable to watch the match live on their TV sets, you can catch Valencia vs Real Madrid match online via live streaming on Sony Liv app as well as on La Liga's official Facebook page. You can also live football score updates on LatestLY here. A draw is written all over the tie unless one of the teams opens up to take more risks. Real Madrid will likely operate on the counter to hit Valencia on the break.